Advertise into OSPF area 100 all interfaces that belong to Vlan 100. Advertise Loopback0 addresses of R4, and SW1 into OSPF. Do not use network statement to accomplish that. Enable OSPF area 0 on serial0/0 interface of R3. Use 'network' statement with the most specific wildcard mask. Advertise into OSPF R6's Loopback0 address. It should not appear in any area. Also make sure that no other connected interface will be advertised into OSPF. Save configuration for the next lab. What type of election occurs in OSPF Broadcast/NMBA modes? What three types of router roles are available in these modes? What is the purpose of DR and BDR? How do DR/BDR get elected? What are the two link-local multicast addresses used by OSPF in Broadcast mode? Is OSPF Broadcast mode Cisco proprietary or industry standard technique? What are the types of relationships built between OSPF routers in Broadcast mode? How can you influence the initial election of DR/BDR? How can you change the role of the router in Broadcast/NBMA networks without re-loading them? What is the meaning of OSPF priority 0? Advertise into OSPF area 100 all interfaces that belong to Vlan 100. Advertise Loopback0 addresses of R4 and SW1 into OSPF. Do not use network statement to accomplish that. Pic. 2 - OSPF Neighbors. Pic. 3 - R3's OSPF Routing Table. Why is 10.0.6.6 (R6) showing 2-Way state with SW1? Why did I enable OSPF area 0 on R3 (serial0/0) interface. What would happen if I did not configure OSPF area 0 on R3? As for the second question, AREA 0 becomes a backbone area in OSPF domain. Without it, only routers within the same area can communicate. In our example we have four routers in VLAN 100. Since, this is a broadcast network, one router will be elected DR (highest priority, or in case of a tie, the highest router-id), another (second highest priority) will be elected BDR. All other routers in this broadcast domain become DROTHERs. DROTHERs only establish FULL adjacency with DR/BDR. Between themselvers, the state is always 2-way. Recall that in broadcast and NBMA networks (legacy stuff such as Frame-Relay, ATM, X.25) require the presence of a DR (and possibly BDR). The routers will form FULL state (full LSA exchange) with DR/BDR but not between all other routers (called: DROTHERS). This save a lot of time on necessary and redundant LSA exchanges. Prefer the router with the highest OSPF priority on an interface (unless DR is already elected). In case the priority is the same Prefer the router with the highest OSPF ID (unless DR is already elected). BDR is elected in the same way only second highest parameter wins. Notice though that the priority of 0 (zero), makes a router ineligible of becoming DR/BDR. This can help to change the role of a router seemlessly (check the later lab on DR configuration). Incidentally, the OSPF broadcast mode is Cisco proprietary, implemented by default on broadcast (Ethernet, Token-Ring) and NBMA (except on point-to-point sub-interfaces). Communication between routers ('hello') still uses link-local multicast 224.0.0.5 address. In order to send update to DR (the only authorized source of updates in these networks), the destination address is 224.0.0.6. 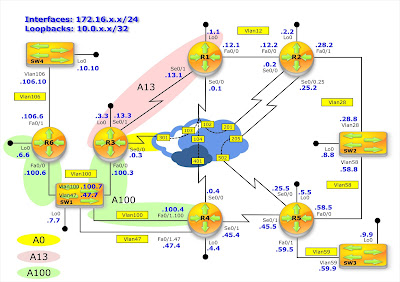 GNS topology used in this lab can be downloaded from the blog's main page.